April wasn’t quite long enough this year for me to get the newsletter out in time – or something like that anyway. With thanks to Stephen Flanagan of the London PHE for his input into the measles textbox and Paul Gringras for help with the sleep series again. Jess has put together another superb article for her minor injuries series and I hope you find the links to the healthy weight clinics helpful for your patients locally. Click here for the April/May 2013 newsletter. Episode 4 and 5 of Jess Spedding’s minor injuries series are on the wrist. at any age. Read more…. Episode 5 is on another wrist injury and one that must not be missed – scaphoid fractures. Read more…. Jess has written a lot of information about the assessment and management of ankle injuries which I have uploaded as a PDF here. I have put the Ottawa ankle rules below as a taster…. You are very welcome to carry out an xray in those who do not fit these criteria if you are worried but there is a very low likelihood of there being a bony injury. I was a bit overloaded in December and couldn’t manage to get a newsletter out. The nurses in my own ED noticed but I don’t think anyone else was particularly bothered! Hope the Christmas break went well for everyone. January 2013 brings some more on speech development, a reminder of the BTS 2008 guideline on cough, another plug for vitamin supplementation and part 2 of Jess Spedding’s minor injuries series. Do leave comments below. 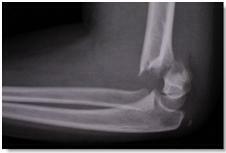 Minor injuries in children are common and mostly self limiting soft tissue injuries that heal with time. 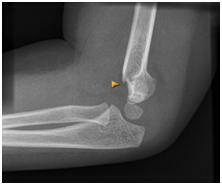 Some injuries are particular to paediatrics (pulled elbow) and others are simply much more common in children than adults (supracondylar fracture). Another consideration specific to children is consideration of growth plate involvement, which if does not heal in a good position could lead to asymmetry and growth problems. Injuries involving the growth plate are graded as Salter-Harris 1,2,3,4, or 5 and they will be discussed in more detail in a future episode of this minor injuries series. – Is the mechanism of injury described consistent with the injury sustained? – Has the child reached the appropriate stage of development to have sustained the injury in the way described? – Is there any delay in presentation? – Has the child (or siblings) presented numerous times before with injuries? fingers to shoulder, clavicle and possibly neck, in the lower limb this would be from toes to hips but also checking the pelvis and lower spine. Hold their hand as though you were going to shake hands, with your other hand gently cupping underneath the elbow, with elbow partially flexed, then firmly pronate (rotate to palm up position). You should feel the clunk of a reduction, but if not, try a firm supination (back to palm down position). Ideally do this half an hour after some analgesia. If you do not feel a clunk it is probably not reduced but either way stop after two attempts, and then allow the child to be somewhere relaxing and ask their parent to let you know if they start playing – if reduced most will soon realise the pain with movement has gone and start playing normally within a few minutes. 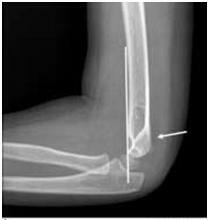 If not reassess and consider a differential diagnosis which may include referral for xray.